Moda Health wants to boost premiums an average of 25.6 percent next year for people who buy their own policies. Lifewise wants to go even higher, at 38.5 percent, and PacificSource 42.8 percent. ...The good news: the state has the final word on rates, and providers can always find a new insurer next fall before any hikes kick in. Meanwhile, some insurers don't want to raise rates, and other proposed hikes are not as substantial. Kaiser Foundation Health Plan of the Northwest is proposing a 2 percent cut, and Providence Health an average 9 percent hike. OK, so from lowest to highest, that's -2.0%, 9%, 25.6%, 38.5% and a whopping 42.8%. Yikes! There's 5 more insurance companies offering individual policies in Oregon, either on or off the ACA exchange. The rates listed above are not weighted by market share. If one company doubles their rates but only has 2 people enrolled, that's gonna be massively cancelled out by another company which cuts their rates by 2% but has 50,000 people enrolled. Unfortunately, only 5 of the 10 companies are listed in the story above. Anyway, as alarming as that 24% increase looks at first glance, it's also important to note that rate changes are relative to what they already were to begin with. For example, according to the BizJournals article, Lifewise may be jacking up their rates 38.5%...but they had the lowest rates to begin with ($222 for a "benchmark" single 40 year old Silver plan). That 38.5% spike pushes it up to $307...but Trillium currently has the highest rates ($290 for a similar plan), and look how terribly they're doing at that level this year (only 40 people total...not 40,000, not 400...40). In addition, there's no information here about how that 38.5% "average" itself is weighted. What if Lifewise is raising rates 80% on their Gold and Platinum plans but lowering rates by 3% on their Bronze and Silver plans? Assuming their 37,000 enrollees are evenly distributed across all 4 metal levels, that would mean an average 38.5% increase, and so on. Obviously that's unlikely to be the case, but it illustrates the point: Be careful about jumping to conclusions when you see these initial rate requests. Finally, there's one more important thing to keep in mind: The Oregonian's Nick Budnick doesn't say in his article anything about whether these requested rate increases take into account a potential King vs. Burwell decision. Most of the people I've conversed with seem to think that Oregon, Nevada and New Mexico are in the clear in the event that the King plaintiffs win...but some think that those 3 states could be in just as much danger of losing their federal subsidies as the other 34 states using HC.gov. Certainly Michael Cannon of the CATO Institute--one of the architects of the King case--seems to be pushing to include Oregon in the potential fallout. I'll ask Mr. Budnick about it, but even if they claim otherwise, I wouldn't be at all surprised if the Oregon-based insurance companies are padding their rate requests to hedge their bets on the outcome of the King case...which I don't blame them for one bit. UPDATE: OK, on Friday, Budnick posted an updated story which includes the full list of rate change requests, for both the individual and small group markets. In addition, I've updated the market share numbers to the best of my ability using the Oregon Insurance Division's onlilne health insurance reporting system. As you can see, with the additional information, the weighted average increase has dropped a bit, from 24% to 23.1%, which is still pretty ugly. All of the enrollment numbers are straight from the Oregon Insurance Division website except for the Health CO-OP figure, which remains from the BizJournals article (it isn't listed at all on the OR site; I assume the CO-OP's public/private legal status is the reason?). The good news is on the small group market side, where the weighted average is only 2.4%. In this case, CO-OP numbers aren't included at all, but unless it has a massive membership in the small group market, it shouldn't move the needle more than a tenth of a point or so. UPDATED x2: I should also note that this year, Oregon's individual ACA-compliant policy rates actually dropped by 2.5% on average, so this may simply be a case of overcorrecting. 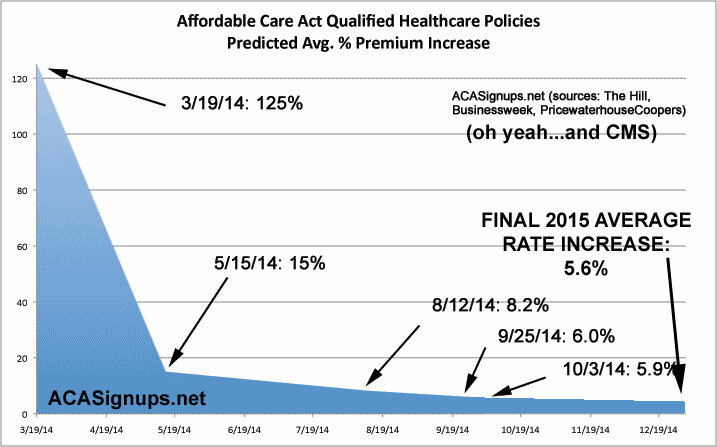 The average rate increase on the individual market prior to the ACA was around 10-11% per year...and a 2.5% drop one year followed by a 23.1% increase the following year would actually average out to, you guessed it....10.3% per year. Still not great news if true, of course, but it lends some perspective: This year the overall rate increase averaged about 5.4% (down slightly from the 5.6% in the graph above); if rates were to go up an overall average of 15.6%, for instance, that would be a 2-year average of 10.5%.